Here’s a little-known fact; Billie Mae Richards, the voice of Rudolph in this classic film, is a woman. Not only that, but she was 43 when this movie was made. Yes, the one-year old reindeer in this story was voiced by a middle-aged lady. Odd, but not unusual for Billie Mae, as she also voiced a boy on the Spider-Man TV series of the late 60s and she was the voice of Tender Heart Bear in the Care Bear TV show and movies. Oh the world of voice-over people; how unusual it must be. These days, animated characters are all voiced by pop stars, rappers, and the latest teen sensations, anything to draw in a crowd. But in the olden times, like the 50s, when people still rode horses to school, the animation industry was completely different, a word of artists & voices, not computers and Kristin Chenoweth. Anyway, back to Rudolph. Here is a stop-motion film that will always represent a distinct era, a relic perhaps, but one that’s still entertaining all these years later, and one that I doubt ever goes away. We’ve all hear the song about Rudolph the red-nosed reindeer; well now it’s come to life. Sam the Snowman narrates the tale, a story about the worst winter in North Pole history and the little reindeer who saved Christmas. Rudolph, the son of Donner, was born with an oddity; a red nose. Not only was is discolored, but it shone, it beeped, and it made him completely different from all the other young reindeer. Rudolph just wanted to be normal; try out for Santa’s sleigh team, impress some does, make some friends, but his nose had different ideas. 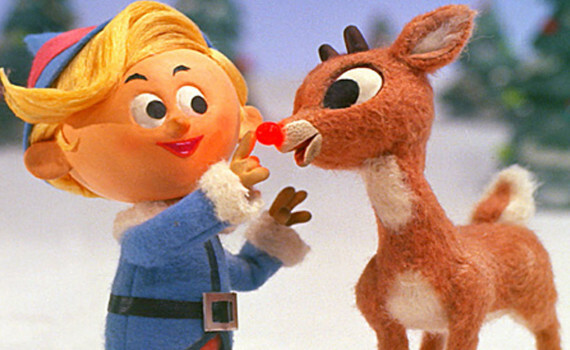 Because he was so unusual, Rudolph decided to go out on his own, but was soon befriended by Hermey, the elf who wanted to be a dentist. Surviving the wilderness wouldn’t be easy, especially with the Abominable Snow Monster of the North out there somewhere, but with a little luck, and help from a prospector named Yukon Cornelius, the unlikely pair just might make it. Meanwhile, Rudolph’s family wants to find him and bring him back, as the storm of the century approaches and Christmas becomes a little more doubtful. It’s more than a classic really, it’s a movie that’s now a holiday icon. You almost have to watch it around Christmas if you want to be allowed to put up a Christmas tree, as it’s as much a representation of the season as mistletoe. It’s a story that American children learn as a part of growing up, and a song you can hear on the radio anytime between Thanksgiving and New Year’s Day. But this movie fleshes out the legend, brings life to the characters, and adds in new lovable aspects. The songs are the most impressive part, some written for the movie itself. Jingle Jingle Jingle, We Are Santa’s Elves, There’s Always Tomorrow, We’re a Couple of Misfits, Silver and Gold, A Holly Jolly Christmas, and of course Rudolph the Red-Nosed Reindeer; great songs all, holiday favorites that seem to be prepared to endure for another 50 years.